Do you write a lot of articles for your website and manually have to do a lot of copy and paste works for printing out its license on different content's footer (some shown and some you dont wish to show) ? With VivoCiti Common License plugin, you can set any license that you wish to show automatically for your users or visitors OR you decide which content to be shown and which content not to be shown. 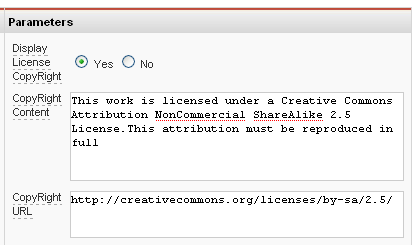 To automatically show license on bottom on every pages' content, you can set "Display License CopyRight" to True. This author's work is licensed under a Creative Commons Attribution-Share Alike 3.0 Unported License.This attribution must be reproduced in full.